NPR is one of several news outlets covering the new book by Michael Hayden, former Director of the CIA and NSA. Photo credit: Julia Reinhart/Getty Images as reported by NPR on 4/30/18. 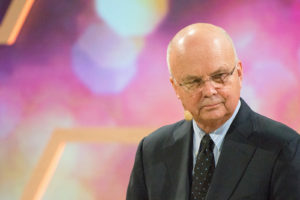 As the former head of the CIA, NSA and with his extensive military experience, General Michael Hayden has had an illustrious career in the shadowy world of intelligence. Our 45-minute interview was too short. Little did I know that soon after leaving, the Special Counsel’s office would release the indictment of 12 Russian military intelligence officers for their hacking, theft and distribution of DNC, Clinton campaign, and DCCC networks. While I would have welcomed Hayden’s insight on this development, I found his perspective on trade, national security, and matters of intelligence very compelling. A long-standing Republican, Hayden has been somewhat cautious in his criticism of Trump, unlike some of his intelligence contemporaries. However, this did not stop the President from adding him to his “Enemies List” of those whose security clearances should be revoked. When offering criticism of the President, Hayden sticks to the facts not theories. Security clearances for experts who have left the government are there to help the current administration and to share their expertise and to minimize failures. The only ones harmed by eliminating this information channel are the President, his staff, and the US government. Once the President loses faith in his intelligence forces and attacks them unmercifully, he could find himself alone and unprotected. Sara Corcoran: In the book you recount on having breakfast with Salena Zito, and you bring up William Jennings Bryan, and you end the conversation with, “What does Donald Trump mean for American security?” How would you answer that question now? General Michael Hayden: Yes, so to quote Salena, people like me took him literally but not seriously. The people Salena wrote about took him seriously but not literally. Unfortunately, he’s governing literally. He’s actually doing all that stuff, and so my line during the campaign … Keep in mind, I didn’t go on TV to criticize Donald Trump. I’ve been on TV for five or six years, but now the questions become, “Wow, this guy said that. Is that okay?” No, that’s not okay. The line I would use is look we’ll see, but if he governs in any way consistent with the language he’s using, I think we have reason to be really concerned [and he is] governing consistent with the language that he used. Just today, he was on his best behavior with Teresa May. But even on his best behavior, he’s spoken about immigration in ways that they’d be very uncomfortable with. I try to (be fair) I talk about the way God made him. He’s instinctive, not reflective. Sara Corcoran: I look at how Peter Strzok testified yesterday … There’s this resonating theme of bias and how a lot of the members on the right kept bringing up, basically challenging his ability to do the job because of bias. General Michael Hayden: That only applies if you want to use human beings. If you insist on human beings, you don’t have to do it. I have my views on the Iraq War. I have my views on covert action X, covert action Y, covert action Z, but I park them. Sara Corcoran: You write about trade in the book, how these alliances have been a national competitive advantage. You noted that TPP was a strategic alliance. General Michael Hayden:Yes, masquerading as a trade deal. Sara Corcoran: How do you describe in today’s climate the trade security relationship? General Michael Hayden: One has to be careful. TPP was a strategic alignment, but its essence was the common trade. It was that Americans facing American values rules-based that had strategic significance. [We] did not use the presence or lack of presence of American forces in Korea to drive the Koreans towards a particular point of view on American beef being sold. President Trump is very comfortable allowing those things to flow back and forth. Don’t get enough money from the Germans. We’re gonna tax your cars. Sara Corcoran: Speaking of cars, I think that the aluminum and steel tariffs, when we look at those figures in the aggregate, pale in comparison to German cars and parts. At that point, we start having a multiplier effect on GDP growth, job losses. General Michael Hayden: Even with current sanctions like tariffs, you’ve got the bottom falling out of the soybean market. You’ve got some small industries relying on Canadian steel closing. Clearly, the prices in Walmart are going to go up before the end of the summer. I think it’s based upon flood theory. This is the way that international trade actually works. I learned a lot in [writing] the book. I’ve talked to a lot of people. One of the things I learned is that … one of the reasons we have the trade deficit that we have is because we still want to keep the dollar as the international currency, which drives people to buy dollars, which drives the price of dollars up, which means then that our balance of trade will get … It’s just not country X, Y, or Z is unfair. There are deep dynamics, but we’d rather keep the dollar as the denomination. Sara Corcoran: Yes, I think you could make those same arguments for China. Sara Corcoran: They do not have a really well-developed service sector of their economy, so of course they’re going to be export driven. When your economy is export driven I would expect, especially when you’re the exporter to the world, that other countries will carry deficits when it comes to trade with you. There’s definitely a piece of economics in there. General Michael Hayden: Yes. The President’s experience … Back to Salena’s seriously but not literally … is also now governing based upon his uninformed campaign speeches. People are telling you, “Well look, he’s just a candidate. Once he gets in there, he’ll have a staff.” No. The uninformed things he was saying have become the uninformed things on which he is governing … [such as the] southern border crisis. Yesterday’s … I’m up in Santa Ana. I’m made up … sitting in front of the camera. All of a sudden he starts his news conference in Brussels. John Berman’s gonna interview me. Berman’s in London, and obviously as the news conference was going on they’re gathering other people. After it was all done, I looked like I was part of the Hollywood Squares. The number of people was fine. It worked well. But on stage yesterday he said several things that were incorrect. Two come to mind. [The first is that] We fund 90 percent of NATO, which there is no way you can do the math that gets you anywhere near that. [Secondly, Trump says that] … he is the first Republican since almost forever to carry Wisconsin … [and that even] Ronald Reagan didn’t carry Wisconsin. I already told you the 90 percent [of what Trump says] is just awful, but Wisconsin was not the state that Reagan didn’t carry. It was Minnesota because it was Fritz Mondale’s home state. Reagan carried Wisconsin twice, but he’s been saying that for a while. That wasn’t just yesterday. He’s been saying it for a while. The thought I had … I didn’t say it on air, but we went to the green room and I said, “Do you think anybody goes up to him and say, ‘It wasn’t Wisconsin. It was Minnesota.’” Does anyone go and tell him? I think the answer is no. Remember the Piers Morgan icecap kerfuffles? Does anybody in his entourage go? Sara Corcoran: He does not fact-check. General Michael Hayden: I don’t know that they do. General Michael Hayden: The defense embargo? Sara Corcoran: These tariffs start becoming a matter a national security, and … one of the journalists in the Washington Post had said that her Subaru is a national security threat. Do you agree? General Michael Hayden: That’s the only way you can tax German cars without going to Congress. Sara Corcoran: He’s really kind of taking advantage of the spirit of the law. General Michael Hayden: No. He’s taking advantage of the letter and not the spirit. I think the spirit is quite clear. Dependence on Canadian steel and German cars are not a national security threat. Congress simply has to reassert its authority, which they can do. Sara Corcoran: You were pretty dire in the Future of Truth segment in the book. I’m noting that the Washington Post found 2,000 false or misleading statements by the President in his first year. You do try to find good things to say about him, and you praised him staying the course in Afghanistan. What can you add to that list including recent events since you wrote the book? General Michael Hayden: He’s stopped the “Little Rocket Man” stuff, which is good. That was counterproductive and frankly dangerous. His two Supreme Court nominees are very good judges. I know Brett Kavanaugh. He’s a wonderful choice. I get it, left-right balance, but they’re good judges. Instinctively I don’t normally list these things and not many jump out naturally. He sold javelins to the Ukrainians, which Obama refused to do. That’s a good thing. Sara Corcoran: I thought he had made some public statements recently about how he doesn’t want to fund any part of that war? General Michael Hayden: Yes, I know. I know, but some things that are done obviously he gets credit for because he’s President. That’s fair, but I think are imposed on him by the bureaucracy. The selling the javelins, I think, to the Ukrainians … Expelling the 60 Russians after the [Novichok] poisoning … I think that came out of the bureaucracy and his role in it was just not to stop it. Those are getting fewer and farther between. He’s getting more comfortable in this job. He’s got fewer folks around him who don’t agree with him. He’s gotten rid of those people. I think there are fewer breaks. That scene in Brussels having breakfast with Stoltenberg, everyone else on the American side was melting. Sara Corcoran: Do you think that Kavanaugh can get confirmation? General Michael Hayden: Not in my lane, but yes I do. That’s not the kind of thing I claim any expertise on. He’ll do well. I know more of him than I do know of him, from the Bush White House. But you know Jack Goldsmith was head of the Office of Legal Counsel and Michael Gerson, who is 43’s best speechwriter, both immediately came out and said he’s a great choice. Both those guys are conservatives. Sara Corcoran: How do you think about some of the decisions coming out of the Supreme Court? General Michael Hayden: I was most disappointed in the Court’s backing away from the questions of gerrymandering. The court came out in the Carpenter case that had to do with you have to get a warrant if you’re going to get geo-locational data on someone over an extended period of time. I’m okay with that. That’s fine. That indicates that the march of technology, some things that we thought were not so invasive of privacy that you wouldn’t need to get a warrant. Now with the mass of data available, they are invasive of privacy, so we’ll go get a warrant. That’s good. I’m the NSA guy, but I’m saying that’s still good. Where I got concerned in the Court was in its reluctance to get involved in gerrymandering. I get it, only slightly, that’s a political decision. The Constitution reserves it to the states. They do it based upon each ten-year census, but in terms of having a horrible effect on the conduct of American politics, the gerrymandering thing is worse than the money thing. The gerrymandering thing is worse than the money thing. Sara Corcoran: Citizens United. Why is that? Do you think it’s done a federal level? General Michael Hayden: No, no. I wouldn’t do it on a federal level. I do think the Constitution allows space in there for courts to review it and claim that this was done for overly narrowly political reasons. The Republicans … have control of the House. More Democratic House members got more votes last election than Republican House members, but they did not turn out into more House members because the votes were ghettoed in certain districts leaving other districts for Republicans. This is a Republican advantage because they’ve been in control of the state governments for a long time. Then the political dynamic is that when you divide the districts up, number one you probably lead to some unfair election results based upon the macro vote count. More importantly, you make districts pure blue and pure red. They aren’t up for grabs between the Republicans and the Democrats. They’re simply up for grabs between Republicans and between Democrats. Since that means the primaries and only the energized vote in the primaries, it drives both parties to their extremes. Freedom caucus on one end and the “Destroy ICE” gang on the other end. There’s nothing in the middle… I think that’s a direct product of gerrymandering, so I think that’s the one that concerned me the most. Sara Corcoran: Let’s [look] a little bit at the Mueller investigation. This is kind of correlated to the Supreme Court. I kind of view Kavanaugh, of course, as just participation on the Supreme Court. I think that at some point there’s gonna have to be a decision about whether Mueller can subpoena the President. This is kind of part, I think an important part, of the vetting process. Do you think this is something Mueller’s going to do and what do you think about the probability of him indicting the President? General Michael Hayden: I really don’t know. Okay? Okay, this is kind of an informed citizen curious look at what other people are saying. I don’t think he’ll ever indict, although I think the subpoena is more possible. We have our constitutional battle over the subpoena, not over the indictment. We’ll see where that turns out. With regard to the broad scope, if I don’t want Donald Trump to be President – [and] I’m not a fan – the only way that should be done, in my mind, is 2020. If it is done through any means that smack of being extraordinary, there’s a third of this country who will judge it to have been a coup and it will be incredibly divisive. That, in a sense, it doesn’t matter to me whether Mueller indicts or not. All I need to know is what did Mueller find, one way or another. Then that allows us to make the political decision in 2020, which is I guess the only safe way to make the decision. Sara Corcoran: Do you think the President can pardon himself? Does he have legal authority to pardon himself? General Michael Hayden: I have no idea. I tend to doubt it. Sara Corcoran: The President made some really colorful statements yesterday about Germany being controlled by Russia. What do you think the basis of that statement was? Was he in the right for being very critical of our ally? Remember that little passage where I talk about the Boy Scouts? Did he get the phone call? Of course, he didn’t get the phone call, but then the question becomes, “Does he know he didn’t get the phone call?” I do think … You know, Michael Gerson’s description of the President living in the eternal now, no history no consequence. Sara Corcoran: I think in the next few days Trump will be traveling to Helsinki to have this one-on-one. General Michael Hayden: CNN invited me to go to Helsinki and meet with their team there. I can’t attend due to family commitments. Sara Corcoran: Is this unprecedented and how would people in the intelligence community feel about this? General Michael Hayden: No. It’s not unprecedented. If you look at the schedule, it goes here, goes to Great Britain, goes to Helsinki. It’s kind of like, “Wow okay. The President’s kind of doing his job.” That part’s normal. What he does in each place, that’s different. You’ve got this … I used the word thuggery on CNN to describe the Brussels meeting. Then he gives the interview to Murdoch’s paper. Now I’ve gotta go and talk to Putin. Sara Corcoran: He’s in a different category all by himself. General Michael Hayden: Oh, no. The agenda, the routine, the itinerary. Check, check, check. But the performance in each place. I am uncomfortable … He actually said … I was paying attention because I’m in the chair for CNN and go on the air at any moment. I’m watching him do that press op in Brussels, right? He actually said that, “This thing in Helsinki could be as successful as Singapore.” I think any objective observation of Singapore was that was a Don King event. That was fight night. Sara Corcoran: He also made statements to the effect that he would think that this meeting with Putin would be easier. I don’t know if it was NATO or the G7. I think he’s being very truthful there. I think he’s actually looking very forward to this meeting. General Michael Hayden: Oh, yes. He likes cutting against the grain. Okay, fine. That’s why I try to be kind in the book. I try to be. Sara Corcoran: You’re fair in your assessment. General Michael Hayden: I try to be kind on air. Sara Corcoran: Yes. Some of your contemporaries and colleagues appear to be much more biased than you. General Michael Hayden: John Brennan and Jim Clapper go way over the edge. Although I have to tell you this, it’s getting harder. Sara Corcoran: You called him your evil twin. I’ll never forget that. General Michael Hayden: The thing in Helsinki is … Here’s a line I use on air. I hope I get different viewers on one show than I get on another. There are only so many ways you can answer one question, and you keep getting the question. One answer I have consistently given on this afternoon for Jake Tapper is simply before he goes, just simply, bulletin on a background, the President is meeting with … “America’s relationship with the Russian Federation is going to be governed by the following three principles, two principles, one principle.” Because wouldn’t it be better if we got along is not a strategy. It is not a principle. In fact, it’s not a goal. Getting along is not the goal. I had no idea what the Trump administration views as success with the Russians. Okay? Sara Corcoran: That has kind of yet to be defined. Participation … I believe that they made some statements along the line, “We want to talk about Syria and Ukraine.” Those are just the two standard answers that I’ve heard out of the administration. General Michael Hayden: Yes, I’m fearful about Syria. Number one, he’s not gonna push him on Ukraine. It would be a little bit like Brussels. It would be a lot like Singapore. He’ll come out and claim something, right? General Michael Hayden: Nothing in reality is going to happen. Sara Corcoran: But why Syria? You think he’s just letting them run amok? Sara Corcoran: One of the great many things that you talk about that the United States has is this history of peaceful transition from one administration to another and how we have this permanent government, bureaucracy. I call it the steady state. General Michael Hayden: Steady state’s good. Yes. Sara Corcoran: Trump may not realize this but the Deep State is actually a really good espionage show on EPIX. I think that one could argue that these (institutions) are under strain, these are under pressure. General Michael Hayden: The President trends authoritarian. He trends populist authoritarian. If I can get the blood of the crowd up, it’s the people’s world. I understand the dynamic. American democracy is governed by two engines. One is numbers. The other is intensity, and populists go to intensity. Is the populist authoritarian, because the counter-balance to intensity is the rule of law, constitutional limits, separate co-equal branches of the government. Constitutionally, the balance against an authoritarian president is sloppy tariffs on Canada because he doesn’t like Justin Trudeau, which is kind of true. The counter-balance is Congress did its thing. Hey, it happened. And that’s not happening. They’re working through. Sara Corcoran: Well, Senators Flake and Corker are trying to push back. General Michael Hayden: They are. All right. But that’s just an example. In a way this is incredibly weird, the pushback on an authoritarian president is coming from the institutions in the executive branch that he would have to use to govern in an authoritarian way. General Michael Hayden: The pushback’s coming from the FBI, the Department of Justice, the intelligence community, and others. Then, in the weirdest of ways, the President is using his party in the branch of government that should actually be limiting the President. He is using his party to attack the elements of the executive branch that are trying to limit the president. I’ve never seen that before. You saw it yesterday for nine and a half hours. Sara Corcoran: Do you have any plans to write another book? General Michael Hayden: I just got done with this. I enjoy writing. ← Trump administration cites success in migrant-family reunification effort, but what of ‘deleted families’?